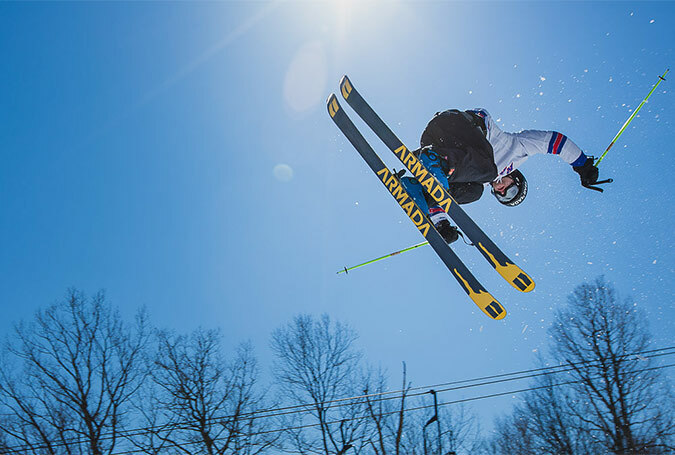 The Powder Ridge Freestyle team is committed to developing fundamentally strong riders and skiers in a program that is focused on growing each athletes abilities in Terrain Parks, Slopestyle, Halfpipe, Boarder and Skier Cross. Get your freestyle on at Powder Ridge. We have competitions each winter. As an elite program, team candidates undergo an assessment of proficiency, attitude and commitment. The program requires significant time and resources for the participant and parents. Mandatory weekend practices and strongly encouraged weekday practices. Training begins in December and extends into March competitions for top northeast athletes. *Ask about 365 Synthetic Snow training! Candidates should have previous terrain park experience and/or be able to maintain open stance parallel or dynamic parallel turns down any Intermediate or Expert Terrain. Freestyle Team members must be age 8 or older as of January 1, 2019. If you’re not sure how to assess this contact us and we can help you find the right program for your family. The team meets Saturdays and Sundays from 9 am – 3:30 pm with a one-hour unsupervised lunch break. All participants are required to have a Season Pass and receive a 30% discount off the Powder Ridge Season Pass. The rewards of membership are significant! Freestyle Team members receive quality coaching, resulting in significant improvements from season to season. Team members forge friendships with teammates and coaches that last lifetimes. Chad has been skiing for over 25 years. As a member of the US Ski Team he trained in aerial skiing in Lake Placid starting at the age of 10. He began to transition to park skiing at 15. In college, Chad competed in diving and is a 13 time All American athlete. After college he coached diving for several years before returning to freestyle skiing full time. Since then, he has built and managed several terrain parks and freestyle programs over the last seven years. Bennett has been snowboarding for about 10 years and has worked at Powder Ridge for four seasons as one of the mountain’s most requested snowboarding instructor. He also works closely with the mountain’s park crew: building terrain park features, snowmaking and building mountain biking trails. Bennett has spent time as a summer camp counselor, wakeboard instructor and can frequently be spotted on a surfboard in the summer. In 2020, Bennett will graduate from college with a degree in Manufacturing Engineering.